Received July 13, 2016; Revised September 12, 2016; Accepted February 5, 2018. 법랑아 세포종은 치성 상피에서 기인한 양성 종양의 일종이다. 하악골에 가장 흔하게 발생하는 양성종양이며 공격적인 성장과 국소적 침범의 특징을 가진다. 그 중 단방성 법랑아 세포종은 방사선학적으로는 단방성의 특징을 가지며 병리학적으로는 낭종의 특징을 가진다. 낭종성 법랑아 세포종의 병소의 크기가 큰 경우 감압술 및 조대술이 보존적인 치료 방법으로 사용된다. 이 치료 방법의 목적은 병소의 크기를 줄여 완전 적출이 손쉽게 하며 악안면 부위 변형이나 신경 손상을 방지하는데 있다. 본 증례에서는 병소의 크기가 큰 낭종성 법랑아 세포종을 감압술 및 조대술로 성공적으로 치료한 치험례를 논문 고찰과 함께 보고하고자 한다. Ameloblastoma is a benign neoplasm originating from odontogenic epithelium. It is the most common neoplasm in the jaws and is characterized by aggressive behavior and local invasion. Unicystic ameloblastoma (UA) has a unilocular feature in radiologic examination and a cystic feature histologically. Decompression and marsupialization are conservative method of treatment of large UA. The purpose of decompression and marsupialization are size reduction of the mass, which makes it easy to handle at total enucleation with protection of nerve damage and facial deformity. Here we report successful conservative treatment of extensive UA using decompression and marsupialization with a review of literatures. Here we report successful conservative treatment of extensive UA using conservative therapy with a review of literature. A 12-year-old female patient was referred to the Department of Oral and Maxillofacial Surgery office for evaluation of facial swelling and a radiolucentic lesion in the left mandibular area. The swelling started one month ago. She had no medical history. Extraoral examination showed swelling and redness in the left submandibular area. Intraoral examination showed dental caries of #75 and no bleeding or discharging in the oral cavity. 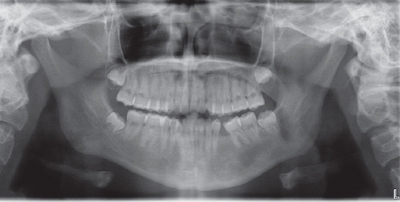 Dental panoramic view showed completely impacted #35 and a unicystic radiolucent lesion in the left mandible (Fig. 1). Bone expansion and rarefaction was shown in computed tomography (Fig. 2). Perforation of the buccal and lingual sides of the mandible was also detected (Fig. 2). The size of the mass was approximately 4.5 cm × 2.6 cm × 2.9 cm (length × width × height). In laboratory analysis, all parameters were within normal ranges. Dental panoramic view. Large radiolucent lesion including #35 is detected in the left mandible. Computed tomography (CT) view. Perforation of both side of the mandible is clearly detected. (A) Coronal view, (B) Axial view. Decompression and marsupialization with incisional biopsy were performed under local anesthesia. Resected abnormal tissues and adjacent normal tissues from around the mass were subjected to histological analysis. A penrose drain tube was inserted into the mass to prevent gingival healing (Fig. 3). Histological diagnosis revealed UA. She had regular intraoral dressing. Six months after decompression and marsupialization, the size of the mass decreased to approximately 2.7 cm × 0.8 cm × 2.0 cm. No perforation of the mandible was detected (Fig. 4). Eight months after decompression and marsupialization, the mass size further decreased to approximately 2.0 cm × 0.8 cm × 1.5 cm (Fig. 5). New bone formation around the inferior alveolar nerve was detected (Fig. 6). Resection of the benign mass with surgical extraction of #35 and #75 was performed under general anesthesia. The resected mass was subjected to histological analysis and the final diagnosis was confirmed as UA (Fig. 7). After surgery, she had no hypoesthesia of the left chin and lower lip. After follow-up for 2 years, she had no recurrence of ameloblastoma and complete bone healing (Fig. 8). She is scheduled for orthodontic treatment. Post operative dental panoramic view. A penrose drain is inserted into the mass. CT view after 6 months follow-up. Perforation of mandible is not detected. (A) Coronal view, (B) Axial view. CT view after 8 months follow-up. Marked newly formed bone is detected. (A) Coronal view, (B) Axial view. The inferior alveolar nerve is protected with newly formed bone (arrow: inferior alveolar nerve). appearance, palisading nuclei and subnuclear clearing (arrows). But it is confined to the cystic lining and shows a very thin lining (×200), (B) This unicystic tumor shows classic histologic features of ameloblastoma, palisading of the nuclei with reverse polarity and nuclear clearing is seen (arrows) (×400). Dental panoramic view after 2 years follow-up. Completely healed mandibular lesion is detected. The rationale for conservative therapy is decompression of the mass using marsupialization.13 Mass decompression promotes bone remodeling and therefore osteogenesis.11,13 In our case, UA invaded the inferior alveolar nerve. Therefore, radical treatment would result in severe nerve damage. However, the use of decompression and marsupialization allowed to successfully performing nerve protection followed by osteogenesis around the inferior alveolar nerve 8 months after procedure. Hence, after surgery the patient had no nerve damage or facial deformity. In conclusion, because the resection of extensive UA might impair swallowing, mastication, and speech due to dentofacial deformity, especially in children,12 we recommend a conservative approach in children due to their development of the craniofacial region. Additional efforts for reducing recurrence rate will be needed. 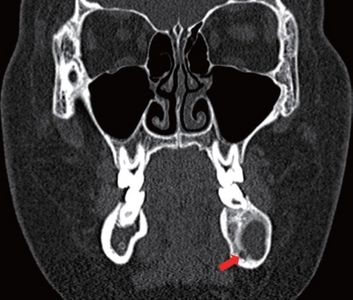 de Paulo LF, Oliveira MT, Rodrigues ÁR, and Zanetta-Barbosa D. Treatment of an extensive unicystic ameloblastoma in a 7-year-old child:the best approach?. Br J Oral Maxillofac Surg 2015;53:292-4. Dolanmaz D, Etoz OA, Pampu A, Kalayci A, and Gunhan O. Marsupialization of unicystic ameloblastoma:a conservative approach for aggressive odontogenic tumors. Indian J Dent Res 2011;22:709-12. Robinson L, and Martinez MG. Unicystic ameloblastoma:a prognostically distinct entity. Cancer 1977;40:2278-85. Sano K, Yoshimura H, Tobita T, Kimura S, and Imamura Y. Spontaneous eruption of involved second molar in unicystic ameloblastoma of the mandible after marsupialization followed by enucleation:a case report. J Oral Maxillofac Surg 2013;71:66-71. Souza Andrade ES, da Costa Miguel MC, Pinto LP, and de Souza LB. Ameloblastoma and adenomatoid odontogenic tumor:the role of alpha2beta1, alpha-3beta1, and alpha5beta1 integrins in local invasiveness and architectural characteristics. Ann Diagn Pathol 2007;11:199-205. Sampson DE, and Pogrel MA. 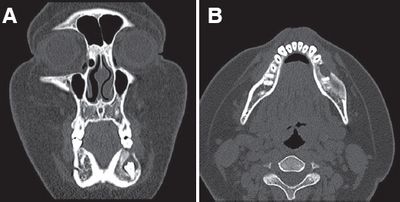 Management of mandibular ameloblastoma:the clinical basis for a treatment algorithm. J Oral Maxillofac Surg 1999;57:1074-7. Lau SL, and Samman N. Recurrence related to treatment modalities of unicystic ameloblastoma:a systematic review. Int J Oral Maxillofac Surg 2006;35:681-90. Pogrel MA. Decompression and marsupialization as a treatment for the odontogenic keratocyst. Oral Maxillofac Surg Clin North Am 2003;15:415-27. Kessler HP. Intraosseous ameloblastoma. Oral Maxillofac Surg Clin North Am 2004;16:309-22. Seintou A, Martinelli-Kläy CP, and Lombardi T. Unicystic ameloblastoma in children:systematic review of clinicopathological features and treatment outcomes. Int J Oral Maxillofac Surg 2014;43:405-12. De Melo WM, Pereira-Santos D, Sonoda CK, Pereira-Freitas SA, de Moura WL, and de Paulo Cravinhos JC. 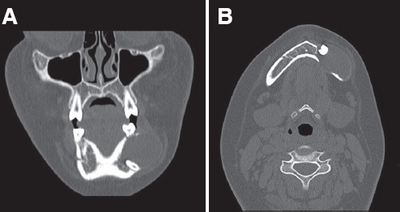 Large unicystic ameloblastoma of the mandible:management guided by biological behavior. J Craniofac Surg 2012;23:e499-502. Furuki Y, Fujita M, Mitsugi M, Tanimoto K, Yoshiga K, and Wada T. A radiographic study of recurrent unicystic ameloblastoma following marsupialization. Report of three cases. Dentomaxillofac Radiol 1997;26:214-8. Tomita Y, Kuroda S, Takahashi T, Ohura R, and Tanaka E. Orthodontic occlusal reconstruction after conservative treatment of unicystic ameloblastoma in an adolescent patient:10-year follow-up. Am J Orthod Dentofacial Orthop 2013;144:466-70.